Digging deep in the second half of the Col d’Eze time trial, Bradley Wiggins (Sky Procycling) made history today when he became the first British rider to win Paris-Nice since Tom Simpson in 1967. The overnight race leader was up against Vacansoleil’s Lieuwe Westra in the 9.6 Col d’Eze time trial, which completed the WorldTour event. Wiggins started the day six seconds ahead but had a brief scare when he was two seconds slower than Westra at the intermediate check point on the climb. The latter completed the uphill course in a time of 19 minutes 14.1 seconds, beating longtime leader Jean Christophe Peraud (Ag2r La Mondiale) by 31 seconds. All eyes were on Wiggins, who put the hammer down on the flatter final kilometres to overhaul his rival. His time of 19 minutes 12.12 seconds was 1.98 faster, giving him a final finishing advantage of eight seconds. “In terms of pressure, it was nothing compared to an Olympic final on track,” he said afterwards, explaining an advantage he had over his rival. “You can also enjoy the moment. I was confident in my ability, I stayed in the front all week and did not put a foot wrong. Movistar’s Alejandro Valverde finished sixth on the stage, 52 seconds back, and sealed third place overall. He ended the race one minute ten seconds off yellow. Westra was gracious in defeat, accepting that the Briton had proved he deserved the victory. “Wiggins was stronger today,” he admitted. That was even more the case for Wiggins, who ended the race with the final stage victory, the yellow jersey of race winner and the green jersey of the points classification. It’s still three and a half months to the Tour de France but he’s given himself a big morale boost in the buildup to his top season goal. He made it clear what he wants to achieve, but also accepted that he has to pace himself. Saxo Bank rider Jaroslaw Marycz was the first rider to start the 9.6 kilometre individual time trial, racing out of the start gate at 11.45 French time. The next rider followed one minute later, with only the top seventeen riders going off two minutes apart. The Pole set a time of 23 minutes 32 seconds, a long way off the 20 minutes 40 seconds set by Raymond Poulidor over 9.5 kilometres in 1972. However comparing times across the generations is difficult due to wind direction and other factors. Of those past champions, seven-time Paris-Nice winner Sean Kelly has the most victories in the Col d’Eze time trial, winning five editions between 1982 and 1988. Marycz’s time didn’t last long, and Sky Procycling’s Danny Pate went significantly quicker with his 21 minutes 30 seconds. His team-mate and the overnight race leader Bradley Wiggins followed him in the car, having previously ridden the climb, with those on-and off-bike reconnaissance periods serving to help him gauge his effort. Pate’s time was beaten by Lotto Belisol rider Bart De Clercq, who went 34 seconds faster. His time was in turn improved by 45 seconds when multiple Vuelta a Espana mountains winner David Moncoutie clocked twenty minutes 11 seconds. 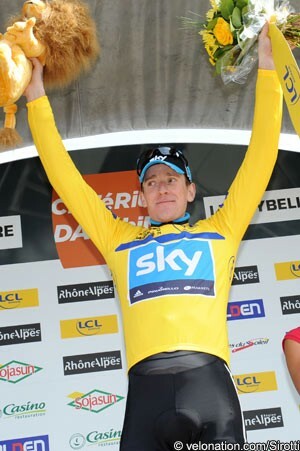 He added that he didn’t believe his time would be enough to beat Wiggins, a prediction that ultimately proved correct. The mark was however more than enough to fend off the efforts of many others, including defending race champion Tony Martin. His race had been a disappointing one, and provisional third at that point, one minute and three seconds slower, did little to salvage it. Another who had motivation to try to post a big time but couldn’t beat Peraud was Omega Pharma Quick Step’s Levi Leipheimer. He was a contender for the final victory until yesterday’s stage, with three crashes plus some controversial riding by the Movistar team leaving him well back. Although victory today would have been a good response, the American had to be content with provisional fifth, 59.81 seconds back. He would eventually finish 22nd on the stage. Leipheimer’s time was soon beaten by Vacansoleil-DCM’s Thomas de Gendt, who shrugged off the fatigue of yesterday’s long, successful breakaway and went five seconds faster. German rider Andreas Kloden’s strong time trial history marked him out as one who could challenge for the top time yet, despite digging deep all the way, he finished 25 seconds off Peraud’s mark for a provisional second place. His two RadioShack Nissan team-mates finished soon afterwards, with Jens Voigt taking ninth and Frank Schleck placing twelfth. In contrast to their solid efforts, French favourite Thomas Voeckler (Europcar) had a far more modest performance, crossing the line a disgruntled-looking 52nd. Navarro stopped the clock in provisional fourth, completing the climb in 20 minutes 19 seconds. The mark was soon improved by Damiano Cunego (Lampre ISD), who bumped him down a place when he went seven seconds faster. France’s Jerome Coppel (Saur Sojasun) was even quicker, going close to the twenty minute mark with 20’04”, second best at that point. This was beaten soon afterwards by Katusha’s Simon Spilak , who was four seconds better. All eyes were however on the final two starters, Westra and Wiggins. It soon became clear that Valverde, third overall starting the stage, wasn’t going to trouble Peraud’s time. It was a different matter for Westra, who smashed the intermediate best time with 11 minutes 29 seconds, two seconds faster than Wiggins. That prompted some speculation that he could yet seize the final race victory. He finished in 19 minutes 14.1 seconds, 31 seconds quicker than Peraud. However Wiggins’ determination and his better aerodynamic position made up the difference on the flatter final part of the climb. The Briton came through to win overall, forty five years after Tom Simpson triumphed in Nice. It's still a long way until the Tour, but he'll be pleased with how things look thus far.